More and more car owners are abandoning halogen headlights. While you may be tempted to join the halogen exodus, you shouldn’t give up on halogen headlights just yet. By driving with the best halogen headlight bulbs available for your vehicle, you’ll have everything you need to keep yourself, your passengers, and your fellow drivers safe on those long stretches of unlit roads. Why are halogen headlights so popular? Halogen headlights are the most widely used headlights in the world. 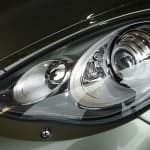 A large part of their popularity is due to the fact that they have been around a lot longer than other headlights, meaning many car owners use them out of habit. Automotive purists, for example, are often reluctant to embrace any new technology and so refuse to stray from halogen bulbs. The popularity of halogen headlights can also be traced back to their relatively low price. They tend to sell for a lot cheaper than most other bulbs and so are the go-to choice for car owners who have to stick to a budget. Halogen headlights can be installed with ease by even the most inexperienced driver, which means the car owner doesn’t have to drop any cash for a mechanic. What are the advantages of halogen headlights? 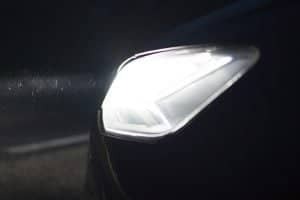 While a lot of car owners choose halogen headlights due to their low price tag and the ease with which they can be fitted, there are a number of other advantages to using them. For example, halogen headlights emit a far-reaching bright white light, illuminating miles of dark road. Some halogen headlights offer increased down-road and side-road views, so you can be certain of your surroundings at all times, regardless of the hour. Halogen headlights can withstand a great deal of punishment and are not easily damaged by knocks and bumps. 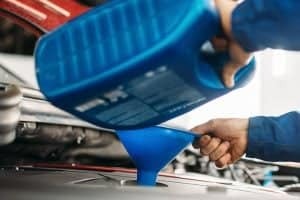 They boast long life spans, so you won’t have to worry about them quitting on you after just a few months, which cannot be said of some of the newer headlight bulbs. What are the disadvantages of halogen headlights? One of the most common gripes car owners have with halogen headlights is that they waste a great deal of energy. Due to the absurd amount of power which is necessary to light them, many drivers who use halogen headlights are reluctant to turn them on even when driving in total darkness. This is, of course, incredibly irresponsible and could lead to disaster for those in and out of the vehicle. Halogen headlights also generate a significant amount of heat and can damage your car if in use for extended periods of time. 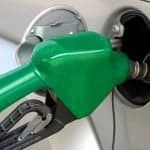 For this reason, car owners who frequently find themselves traveling late at night have been ditching halogen headlights in favor of bulbs which are less likely to overheat. What are other headlight options? If you have been using halogen headlights for a while and are thinking about switching things up, there is no shortage of halogen alternatives from which you can choose. Xenon headlights, which are also known as high-intensity discharge (HID) headlights, are often seen as a more efficient alternative to halogen headlights. An HID bulb emits a strong and steady beam of light while using a fraction of the power of a halogen headlight. However, HID headlights can be pretty expensive and will almost certainly blind other drivers as they approach you. LED headlights emit a light which is brighter than that of halogen headlights and warmer than that of HID headlights. 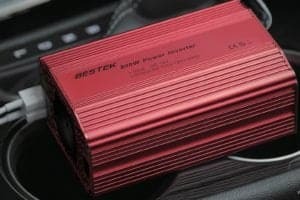 However, they are quite expensive to produce, which is reflected in the price tag of even the least expensive LED bulb. LED headlights are not as durable as their halogen counterparts and struggle to withstand high-engine bay temperatures. This video pits a set of halogen headlights against a pair of LED alternatives. It should give you a pretty good idea of how effective halogen bulbs are when it comes to night driving. What headlight bulbs are right for me? Being the automobile nut that I am, I have experimented with a number of different kinds of headlights over the years, but I have always returned to using halogen bulbs. 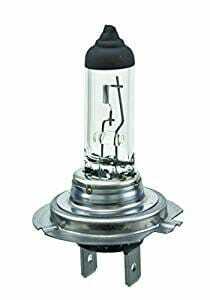 While a portion of my love for halogen bulbs is admittedly the result of nostalgia (I personally fitted my first car with halogen headlights), a larger part of it comes down to the fact that they are just more convenient than most other headlight bulbs. Halogen bulbs are inexpensive, so they are perfect for young drivers who don’t have a whole lot of money to spend on automotive equipment. They also provide superior illumination, making them a great choice for older drivers whose vision may be dimming after decades behind the wheel. Regardless of what category you fall into (count me in the latter), you will benefit immensely from purchasing a quality pair of halogen headlights over their LED and HID rivals. The Night Breaker Unlimited headlights from OSRAM are halogen bulbs which combine the best of the past with modern headlight technology. OSRAM means business when it comes to providing high-quality bulbs. Increased reach—The beam of light produced by a single Night Breaker bulb can be up to 35 meters longer than that of the average halogen bulb. A pair of these bulbs can produce 110% greater light than a standard set of halogen headlights, and that’s not hyperbole. Soft light—While an OSRAM Night Breaker Unlimited bulb has the power to illuminate every pebble strewn across the road ahead of you, the light which it emits is not abrasive or aggressive. This means you don’t have to worry about blinding yourself or approaching vehicles while driving late at night. Delicate—One of the most common complaints about OSRAMs Night Breaker Unlimited bulbs is that they are extremely delicate and can be easily damaged by jolts and jumps. You should take extra care when installing one of these headlights as accidentally touching the bulb can seriously affect its performance. Electric razors, televisions, sound systems–Philips does it all. The Philips CrystalVision Ultra headlight bulbs are the perfect example of why the Dutch brand has been dominant in so many areas. Xenon effect—Xenon bulbs are growing in popularity owing to the intense light which they produce. 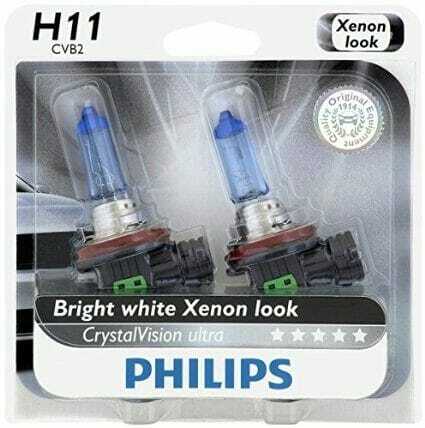 If you would like to experience Xenon headlights but don’t have the budget or desire to abandon halogen bulbs, you’ll definitely want to try the Philips CrystalVision Ultra bulbs. These bulbs are designed to give the bright white light of Xenon headlights at a fraction of the cost. 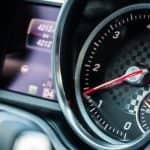 Street legal—While there is no shortage of automotive accessories designed to help drivers customize their rides, few of them are actually street legal. Many experimental headlights are banned from car shows or sketchy drag races. The Philips CrystalVision Ultra bulbs, however, are DOT approved, meaning you can proudly display the individuality of yourself and your vehicle across the highways of America. 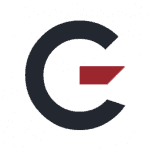 Expensive—Price at which they sell is significantly higher than that of most halogen bulbs. So we’re going to go from some of the most expensive halogen bulbs on the market back down to the lower end of the price spectrum. 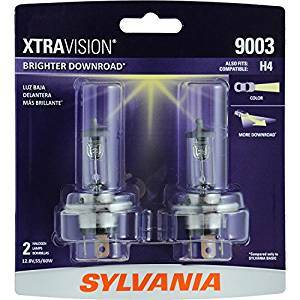 The Sylvania XtraVision headlight bulbs promise a performance almost equal to that of the previous bulbs but can be purchased for less than half the price. 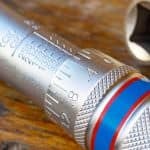 Down-road visibility—When the Sylvania design team began work on the XtraVision range, their aim was to create a bulb that offered greater down-road illumination than the bulbs of rival brands and it appears they have done just that. A set of Sylvania XtraVision headlights offers significantly better down-road visibility than a pair from most competing manufacturers. Durable—Halogen bulbs tend to be pretty delicate. A low-speed collision with a fire hydrant can be enough to destroy a set of halogen bulbs beyond repair. The Sylvania XtraVision headlights, however, are among the most durable bulbs on the market. Each bulb is fitted with a sturdy filament to ensure the light continues to shine regardless of what obstacles it encounters. Short lifespan—Despite the precautions taken by Sylvania to protect its XtraVision bulbs from road collisions, nothing can defend them against the incessant passing of time. These bulbs do not offer a long life span, with many car owners reporting they failed within less than a year of use. 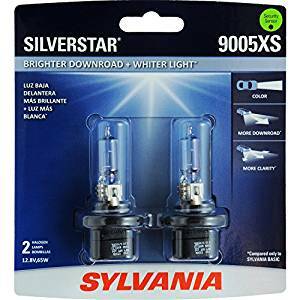 I want to show you another halogen bulb from Sylvania, this time the SilverStar. Side-road visibility—Like the previous bulbs from Sylvania, the SilverStar headlights offer increased down-road visibility. However, these bulbs also promise an increase in side-road visibility, meaning you will always be aware of your surroundings while driving. Minimal glare—I’m sure you know how frustrating it is to be blinded by the way-too-bright lights of an approaching driver’s vehicle; such moments of light-induced blindness are caused by the glare of the nearing headlights. SilverStar bulbs are designed to minimize glare, so you never have to worry about angering fellow motorists. 125 hours of performance—The warranty included with a pair of SilverStar claims they will run for a total of 125 hours without issue. While this may seem like a lot if you only use your car to get to and from work, drivers who make frequent long journeys will have little use for these bulbs. For those looking for a straightforward halogen bulb that won’t break the bank or complicate the simple task of turning on their headlights, HELLA offers this standard bulb. Inexpensive—Because the HELLA H7 Halogen Standard Bulb doesn’t offer any innovative—bordering on wacky features—it can be purchased online or in the store for less than $5. Despite its low price, this halogen bulb can last for years on end and has been rigorously tested to ensure it meets HELLA’s high standards. Sold individually—I should point out that you should never replace just one of your car’s headlights. In order to ensure synergy between your bulbs and symmetry in the beams they emit, you should always install headlights in pairs. However, should one of your bulbs break before you have the chance to fit it, you don’t want to have to spend money on another set of two. The HELLA H7 Standard Halogen bulb is sold individually, meaning you’ll never have to worry about paying for more than you need. H7 only—As the name would suggest, the HELLA H7 Standard Halogen bulb is only available in the H7 form, meaning it will be incompatible with any vehicle not equipped to run H7 bulbs. HELLA does offer standard bulbs in different styles and sizes, but they will vary in performance and price. 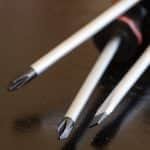 Over the past year or so, I have tested out each of the bulbs included in this article. 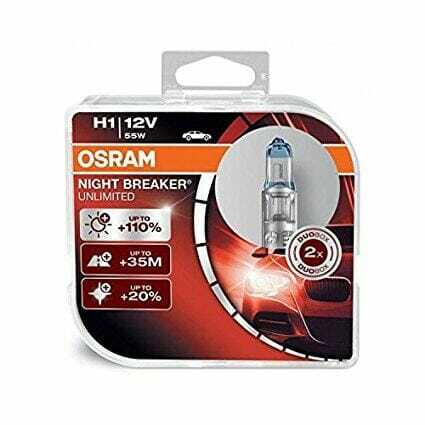 While I can’t say one is absolutely better than the others, I can tell you that my favorite headlight bulb is the OSRAM Night Breaker Unlimited. OSRAM’s products have long been a favorite of automotive enthusiasts and the Night Breaker bulbs only reaffirmed—in my mind, at least—that OSRAM is among the premier manufacturers of halogen bulbs on the market. These headlight bulbs manage to utilize new technology without deviating from what we all love about halogen bulbs. The down-road visibility of a single Night Breaker Unlimited bulb is greater than many full headlight sets, which will come as no surprise to those who are familiar with the work of the OSRAM design team.